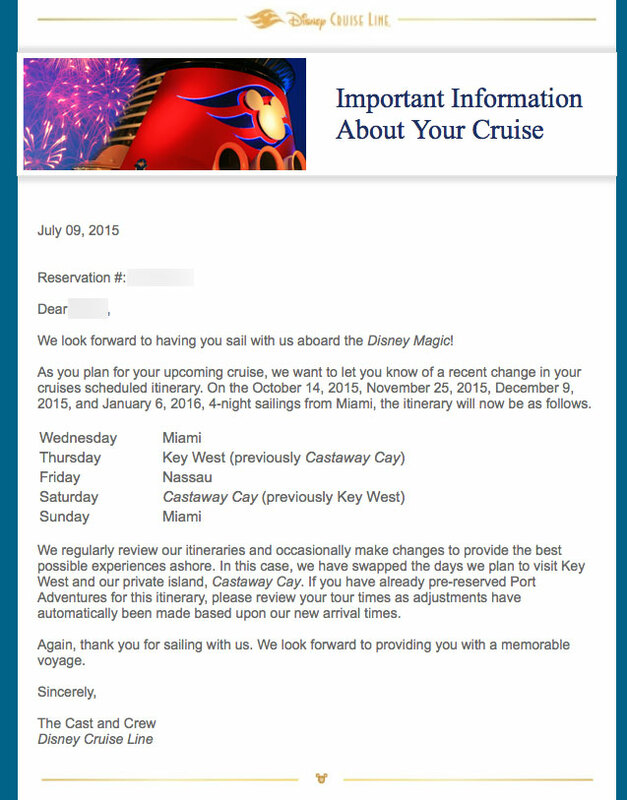 Earlier this month, Disney Cruise Line began to alert guests booked aboard select 4-Night Bahamian Cruise on Disney Magic – Itinerary A from Miami of an itinerary change. The October 14, 2015, November 25, 2015, December 9, 2015 and January 6, 2016 sailings are now 4-Night Bahamian Cruise on Disney Magic – Itinerary H.
The only difference between Itinerary A and Itinerary H is day 2 is now Key West and Day 4 is Castaway Cay. 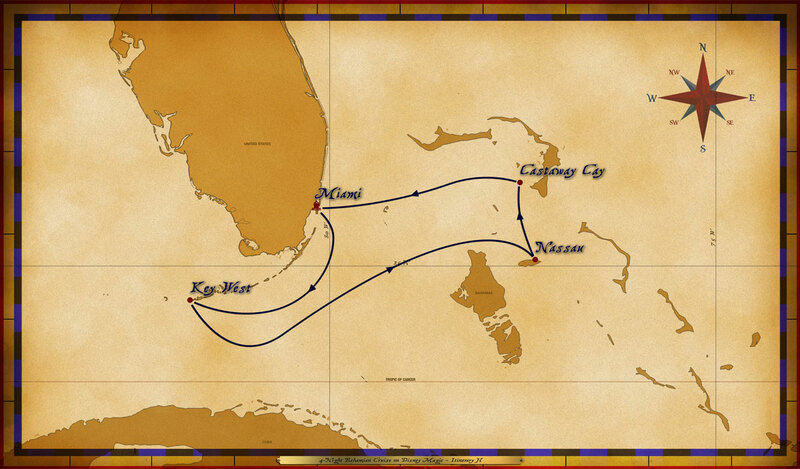 Itinerary H will embark from Miami then head to Key West, followed by Nassau and finish with Castaway Cay. Any pre-booked port adventures through Disney have automatically been adjusted, but if you booked a private tour in Key West you will need to contact the tour operator and make the change. Below is a copy of the email sent by DCL to guests booked on these sailings. This entry was posted in Itineraries, News and tagged 4-Night, Disney Magic, PortMiami by Scott Sanders. Bookmark the permalink. Scott. You mean January 6, 2016, not 2015? Huh……. No, the way I figure on October 21, 2015 we will all cram into the DeLorean and head back to 1985. Then, come back in early January for the cruise before returning to the present day. Thanks, I hope this is the last of the errors in the post. ‘Back to the Future’ Cast Reunites Just Before October 21, 2015! I like your sense of humor. LOL. We went on this same cruise in April. I wish the ports had been switched then. With Key West as the last port, we had to go through immigration before departing the ship. I assume with Key West as the first port, you don’t have to bother with that, as you haven’t been to a port outside of the US yet. I am glad about that too. The line goes quick, but a pain in the tush nonetheless. I’m doing this cruise in March 2016, do we think it will be changed for us as well? Any word on that? Those are the only sail dates listed on DCL’s website for Itinerary H. My guess this had more to due with the number of ships schedule in Key West on those dates. So the Nov 25 sailing as you in Key West on Thanksgiving. Does anyone know, given its a holiday, will anything be open?